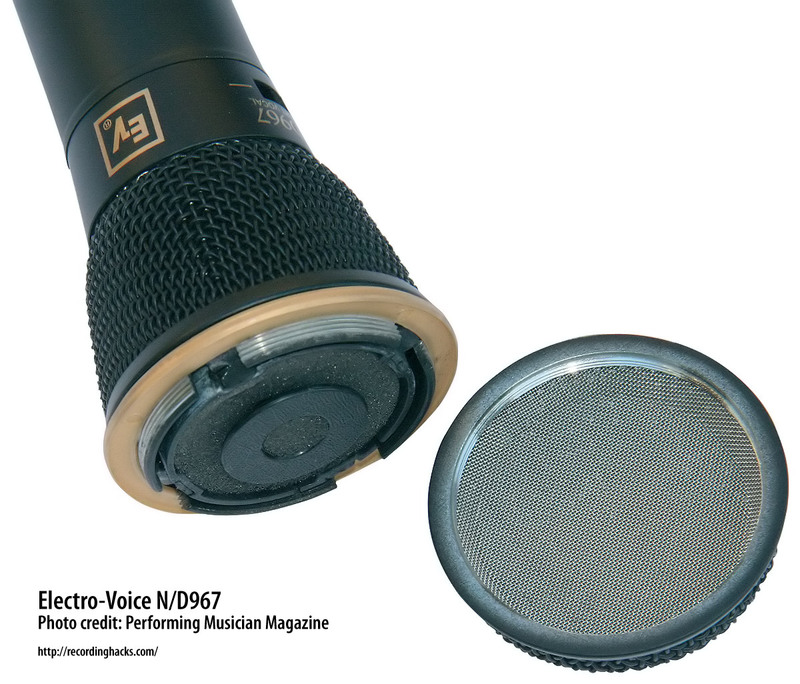 The N/D 967 is a dynamic vocal microphone in a traditional ball-mic form factor. It has a supercardioid pickup pattern, which has a higher rejection rate for off-axis sounds than does a cardioid microphone such as the Shure SM58. The mic has an EQ switch, presented as a “personality switch.” When enabled, the mic attenuates mid frequencies (200Hz–1500Hz) by 3–4dB. 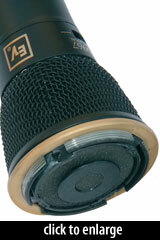 According to E-V, the switch gives the mic more “cut and clarity” when used close to the sound source. See the mic’s frequency chart for an illustration of the mic’s proximity effect. When placed against a sound source (e.g., with the singer’s lips touching the grille), the mic has a mid-low boost of +16dB at 200Hz. The mic’s grille and internal pop filter can be easily removed and washed. It ships with a mic clip in a storage pouch. [T]he N/D967 handled louder material better [than the N/D767] and retained absolute clarity throughout the whole dynamic range. There were one or two occasions when… I would have been tempted to roll off the top end a little, but what really impressed me was no matter how loud we went … the vocal sound remained focused and clean, and the N/D967 gave the impression that it was never going to run out of headroom no matter what we did. The Electro-Voice N/D967 is also known as: ND967.